Note: According to the Oct/Nov 2015 London Drinker magazine, it has been taken over by Fuller's. We haven't visited since, so some of the below may be out of date. Also, as of Spring 2016 it's closing for several weeks for a refurbishment. 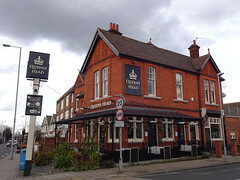 Previously known as the Owl and Pussycat, the name of this pub changed in late 2007 back to the original name, the Queen's Head. As of October 2007, food is served noon-3pm and 6pm-9pm Monday to Thursday; noon-8pm (sometimes with a break 3pm-5pm) Friday and Saturday; and noon-4pm Sunday. As of February 2008, main courses are priced between £6 and £9, with most at around £7.50. The menu includes three vegetarian dishes. Bob visited on a Monday afternoon in February 2008. Everards Pitch Black was on, at £2.90/pint, and offered in a choice of glasses: jug, normal, or straight. Bob tried the Kobe beef burger (£9, including chips and salad) photo. Also has a pool table. Last visited by Bob, 25 February 2008. Prices verified on that visit. Opening hours taken from the 2008 Good Beer Guide. Food times confirmed by phone, October 2007. Last edited 2016-04-06 18:42:01 (version 19; diff). List all versions. Page last edited 2016-04-06 18:42:01 (version 19).